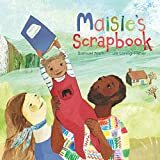 Maisie’s Scrapbook presents a year in five-year-old Maisie’s life at the centre of a loving, multiracial family. From the endpapers, with their child-like family drawings and lettering through double page spreads which show the changing seasons, this book gives the reader a child’s-eye view of her own world. Dada tells her African tales of Anansi the spider and lets her spirit and imagination soar and calm Mama is her source of steady comfort when she is frightened or upset. Maisie’s parents may have different coloured skin, different words for the same things, they may cook different food, wear different clothes and play different musical instruments but they praise her just the same, nag her just the same and love her in the same way. The mixed media illustrations portray the move through the seasons beautifully and use colour, texture and shade to skilfully contrast the bright family scenes with the dark, swirling backgrounds of Dada’s folklore tales. This is not strictly a story, but the idea of a scrapbook working through the seasons is very effective as a way of portraying a happy year in the life of a much-loved mixed-race child. Cultural differences are celebrated and many children and families will see themselves reflected in this gentle, joyful and comforting book with its depiction of unconditional love.